Native American Belt Buckles for Sale! 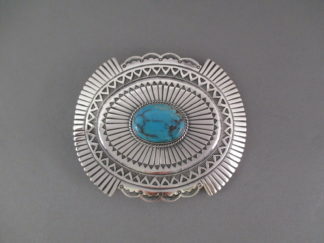 Our online selection of belt buckles, hand-crafted by Native American Indian jewelry artists. Authentic Native American Indian Belt Buckles can be worn with dress-wear or casual/everyday-wear. Native American belt buckles have been some of the most popular handcrafted jewelry items for many years. Two Grey Hills Indian Arts & Jewelry offers one of the finest selections of Native American Indian belt buckles available, created by top silversmiths and award-winning artists. Turquoise belt buckles, inlaid belt buckles, and sterling silver overlay belt buckles; hand-made by Navajo, Hopi, and Zuni Indian jewelry artists. High quality craftsmanship, high quality stones, and heavy-gauge sterling silver. These exceptional pieces are wearable works of art!